What makes a trip luxurious? 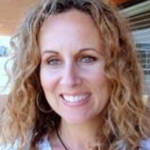 Is it high thread counts, a destination spa, a concierge who anticipates your every need? Or is it unfettered time with friends and family, drinking wine and feeding rescued animals? Maybe real luxury is time and experiences; the rest is just financial. 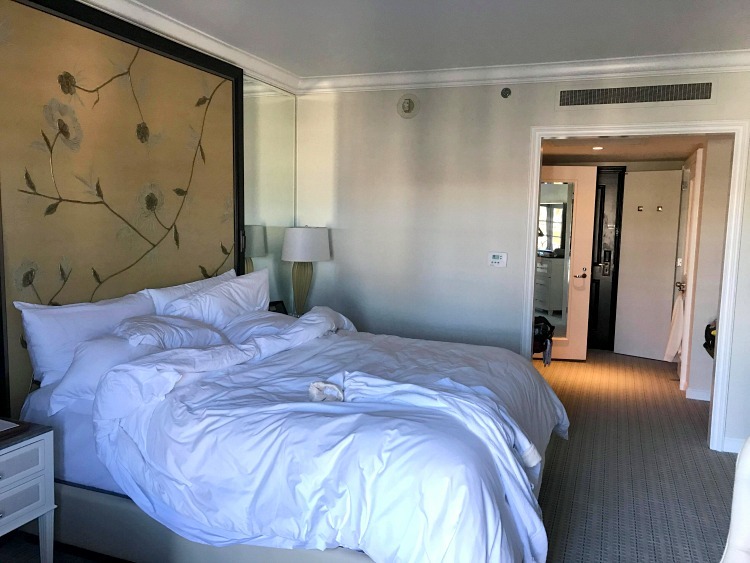 It was easy to ponder the questions and come up with answers on a luxury girlfriend getaway in Los Angeles. Luxury? check. Friends? Check. Wine? double check. Photo Credit: Kim Orlando. Every hotel can’t be luxury; if all hotels are deemed luxury, the luxurious becomes, well, average. But nothing was average when I was a guest of Fox Searchlight at the premiere of the movie Gifted in Los Angeles. I got to travel with girlfriends and stay at some – ahem – ‘average’ hotels. Time with my girls is a luxury, no matter where we go! Then I got to enjoy a wine safari with views so luxurious I forgot I was only an hour away from downtown Los Angeles. First, I was at the Four Seasons, a name associated with luxury travel. This venerable hotel is undergoing a renovation, but even without the latest modernization, the hotel still shines with its abundance of fresh flowers and phenomenal service. The hotel is the epitome of luxury, offering many premium amenities: free coffee and continental breakfast daily in the lobby, iPads in every room, a top-notch fitness center with nonstop fresh fruit and bottled water. But luxury has its price, and I resented paying $37 for a cocktail and two small scoops coconut milk ice cream. Then it was on to Viceroy L’Ermitage, aka the Viceroy Beverly Hills. This place just blew the Four Seasons away. You could walk to Rodeo Drive. But why would you? The five star hotel provides free local car service, so your Manolo Blahniks will never get scuffed. The hotel pampers kids and dogs as well. There are pool toys for use at the rooftop pool, as well as board games, books and hooded towels for young children. You know that kid who hates schoolwork, but is an amazing artist? Teachers may not appreciate her genius, she may not score well on standardized tests, but she has her own gifted qualities? The eclectic Kinney hotel is that girl. She may not fit the standard, but she wows in her own unique way. The Kinney is bright and cheery, with neon lights and colorized book shelves. 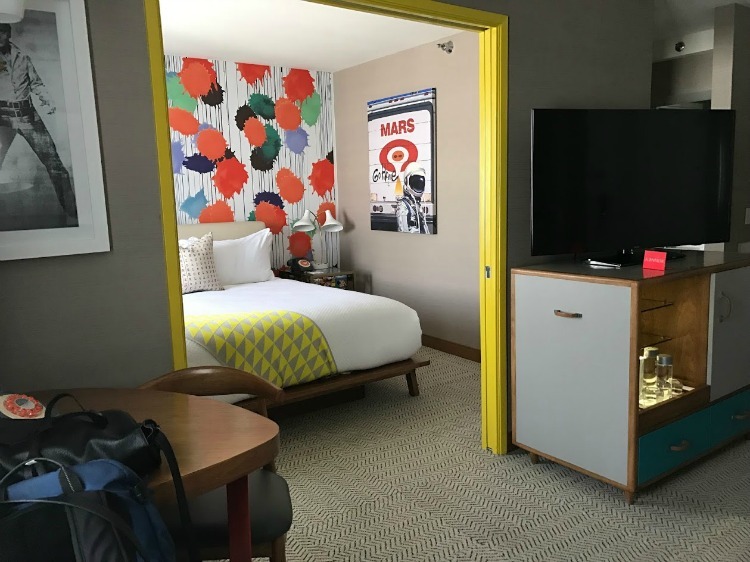 The retro feel, including old record players used as decor, and beach cruisers available to rent, gives this hotel a funky vibe. Robert Vargas is currently painting a third mural at the Kinney, adding to the hotel’s collection of his murals. 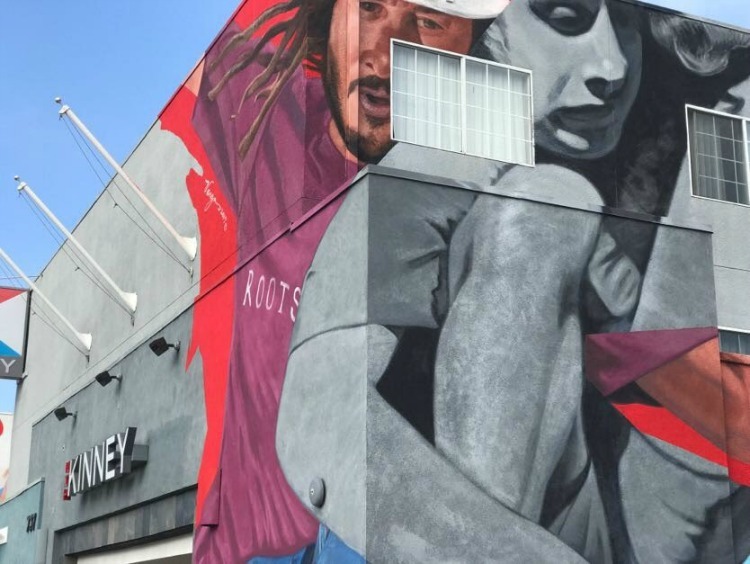 These include Robert Downey, Jr., jumping into the pool (it’s painted over the pool) and another of Tony Alva, the father of extreme skateboarding. Guest room at The Kinney Hotel. Photo Credit: Kim Orlando. The Kinney is what millennials might embrace in their definition in luxury travel: free breakfast, a social area with ping pong tables, a personal liquor locker, a hot tub, and a junior suite renamed a crash pad. But I didn’t feel old here. I felt artsy. I rented a beach cruiser, headed to the boardwalk and wondered if any of the runners, skateboarders or surfers I saw were considered prodigies. Looking for a fun , wine-infused safari? 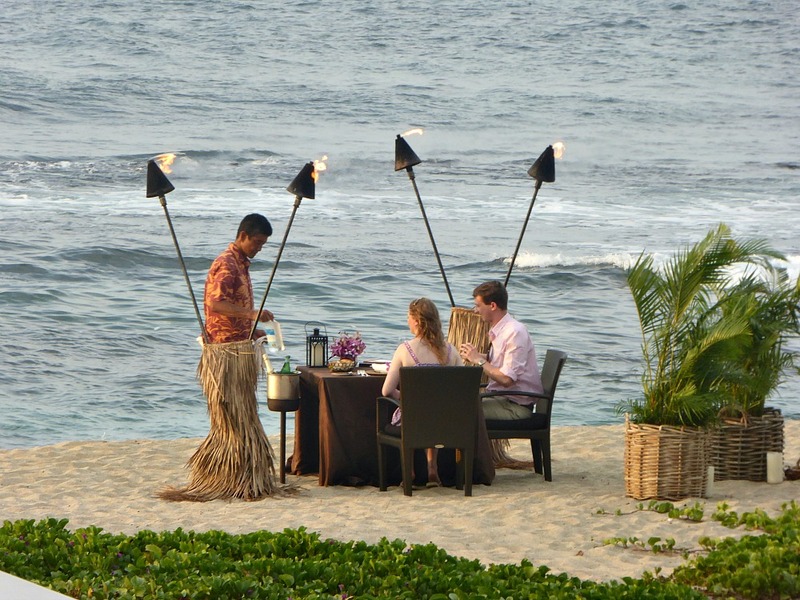 Malibu Wine Safaris is a great choice. Photo Credit: Kim Orlando. When I think of California wine country, I think Napa. And when I think of Malibu, I think beach. 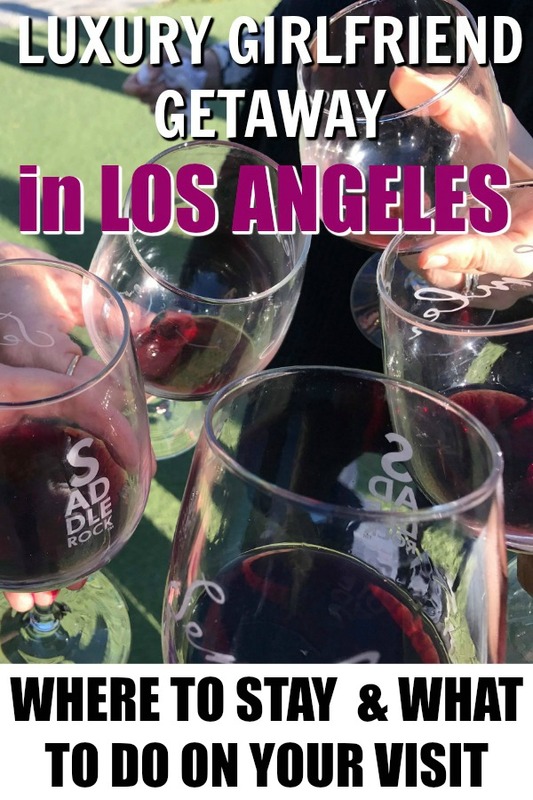 Malibu Wine Safaris is a hybrid of the two: Saddleback Winery and ocean views. This ranch and vineyard is in the Santa Monica Mountains National Recreation Area, just an hour’s drive and a world away from where we were staying at The Viceroy in Beverly Hills. The 1,100 acre Saddlerock Ranch feels like a film set. There is a kind of back lot area with airstreams used for weddings, and two houses are available for rent through AirBnB. Atop a hill is a picturesque small castle overlooking the surrounding mountains and gorgeous valley below, another perfect wedding backdrop. A new edition, opening soon, will showcase antique cars. 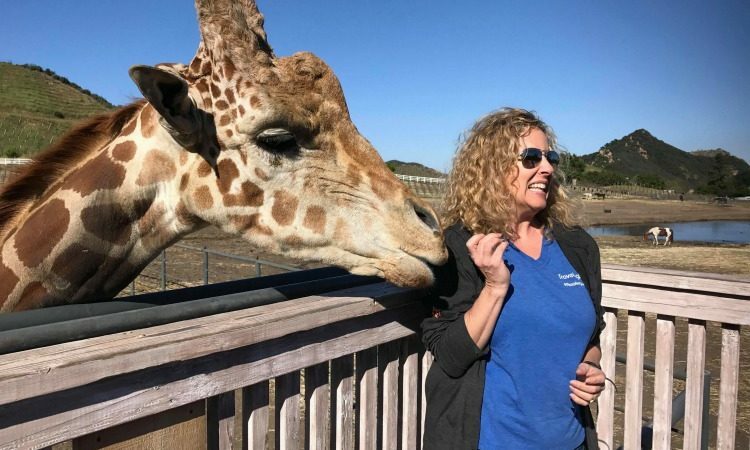 But I was here for the wine and to feed Stanley, the celebrity giraffe. 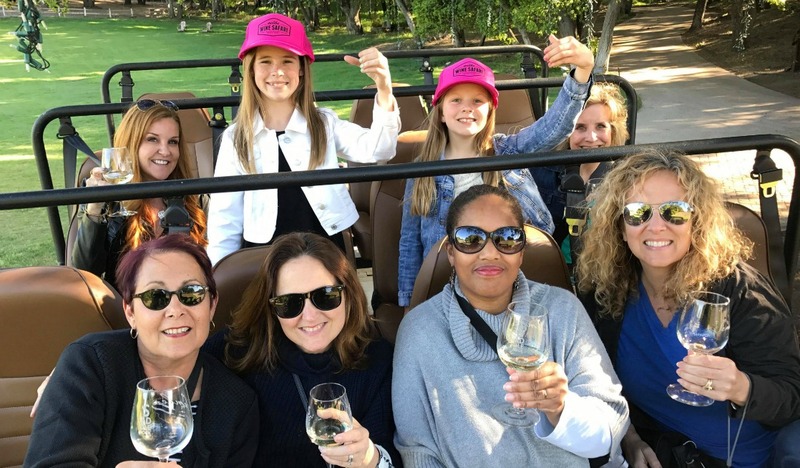 We were each provided with a wine glass, a seat in the safari Jeep and a tour guide who shared entertaining stories about the family and the rescued animals they care for on site. First stop is a photo op at Stanley’s place. The friendly giraffe earns his keep by doing Skittles commercials, Snap Chats and movies (Hangover II– apropos?). After posing with Stanley, we fed yaks, admired llamas, alpacas, and zebras and explored Chumash rock art in a painted cave. It’s a photographer’s paradise and we hit it at the perfect time, at the beginning of spring and after two months of rain. The hills were alive, as they say, and the wildflowers were blooming. Between animal visits, we stopped for photos and wine tastings: threes whites and three reds. 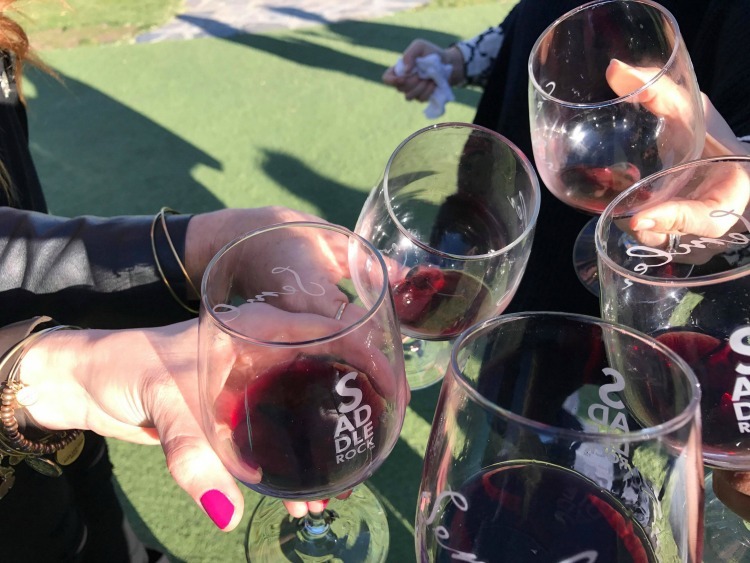 Cheers to a fun girlfriend getaway including Malibu Wine Safaris! Photo Credit: Kim Orlando. Everyone found a wine they liked and we all went home with something. The gift shop curates locally made items and, of course, their wine varieties. My choice was a t-shirt with a picture of Stanley, the perfect way to remember our visit to Malibu Wine Safaris. The family-owned safari does accommodate kids on weekdays and via private tours. Since the owners have nine children, that makes sense. Kids are not allowed on weekends (except for a private tour) as that time is reserved for the 21 & over crowd. I found that, although Malibu Wine Safaris tickets frequently sell out, it’s still a hidden gem. It was so unique, I am planning a return visit. When I posted pictures of our trip on social media, my Cali friends were surprised. They either did not know about the safari, but now are planning to book their own excursion soon. TravelingMom pro tip: GO! Book early, and read the rules (must have closed toe shoes). Bring a picnic and friends or a romantic other and use a car service. Uber was around $85 midday for four of us from Beverly Hills. Note: I was a guest of Fox Searchlight Pictures. They paid my travel and accommodations. 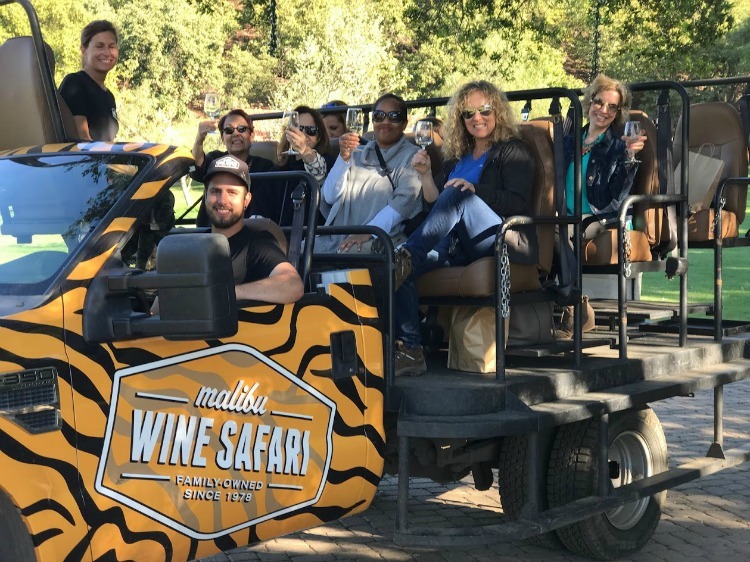 Malibu Wine Safaris provided our group with a tour.